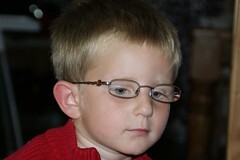 Has my wee man's eyesight been so bad all this time without any of us noticing? :-( It nearly broke my heart to see this new excited Pudge, even happier than the usual Pudge. They look quite nice on him. I have heard the same from parents to kids with arthritis - when they start an effective treatment, suddently the kids are whole new persons. But since they've never known anything but pain, they don't know it's wrong.